The office for CAH Undergraduate Research and Intellectual Opportunities was established in 2008 to expand the opportunities for undergraduates to engage in research and mentored scholarship at Georgia Southern University and offer undergraduate students the opportunity to work directly with faculty on projects that involve research, scholarship, and creativity. These projects are designed and implemented by students with the support and guidance of faculty. 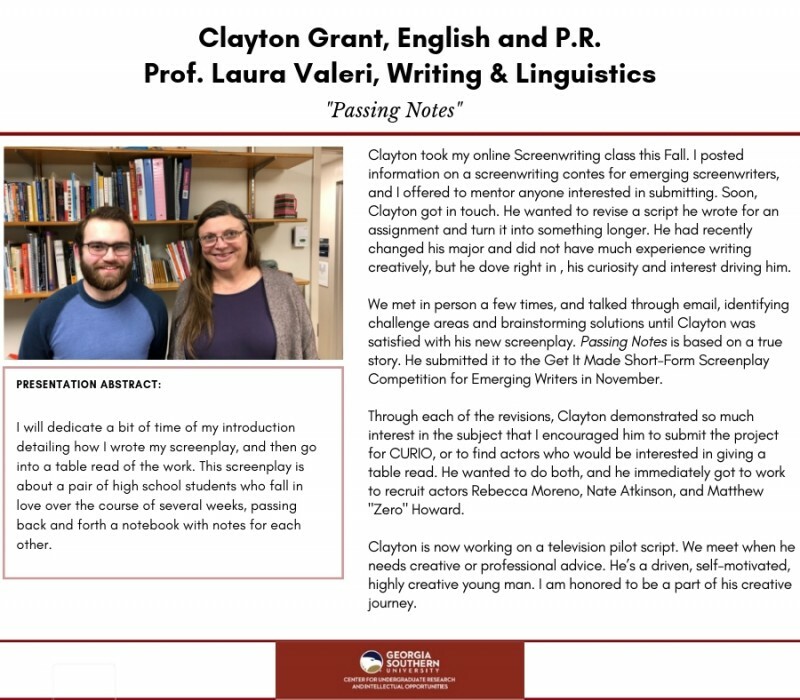 CURIO offers itself as a valuable tool for students in the College of Arts and Humanities who have a passion for their discipline and an interest in getting involved with research. The center promotes and recognizes undegraduate research in the college. 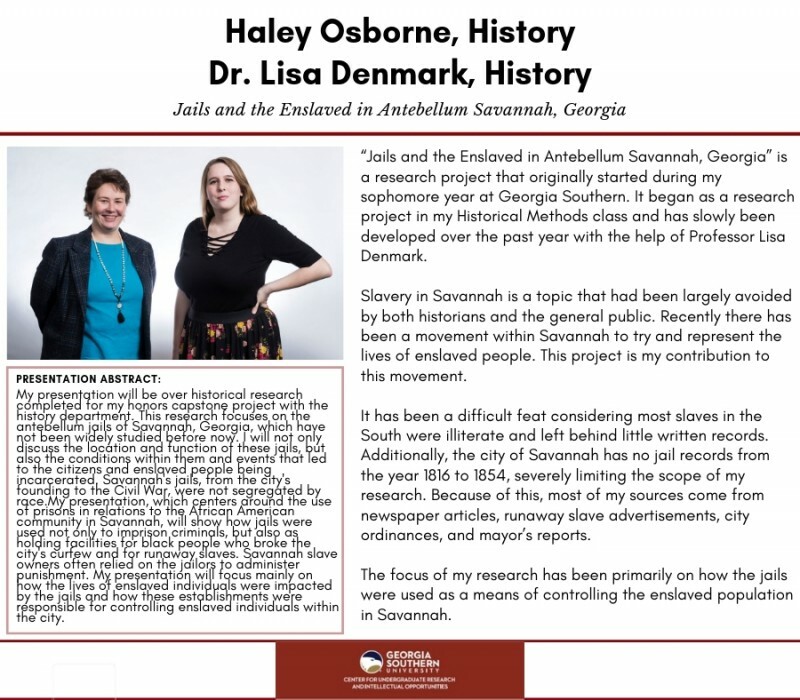 Georgia Southern University and the College of Arts and Humanities encourages undergraduate research because research benefits the student, faculty, college, and university. CURIO is committed to facilitating undergraduate research and helping students with their research needs in any way possible. 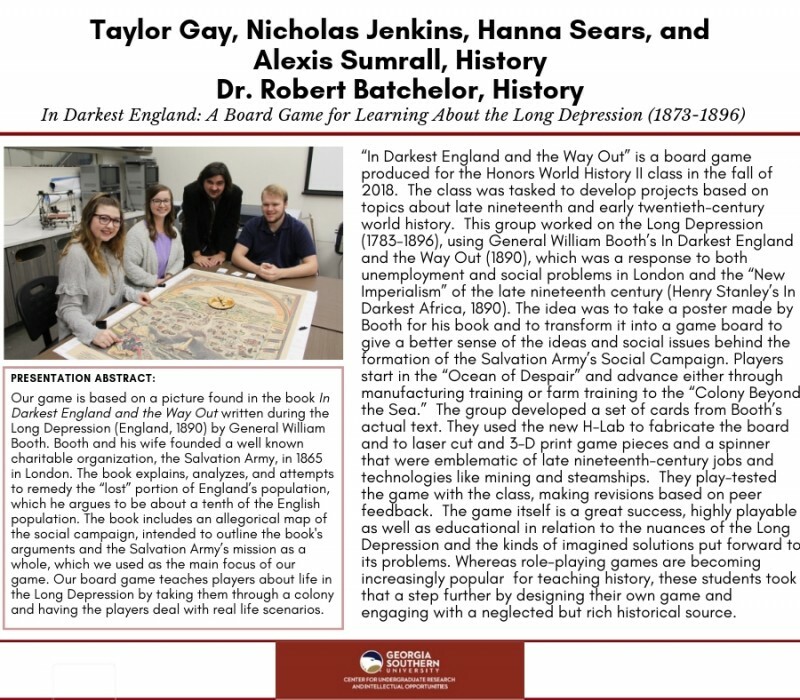 By engaging in undergraduate research, students will learn to apply what they already know in ways that interest them and allow them to influence others. 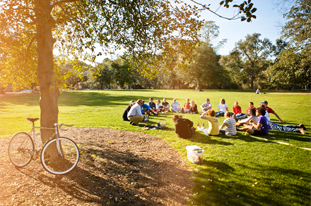 Along the way, students will develop new skills, meet others with similar interests, gain confidence in themselves and their scholarship, define their own style, and deepen their connections to Georgia Southern and the academic community. 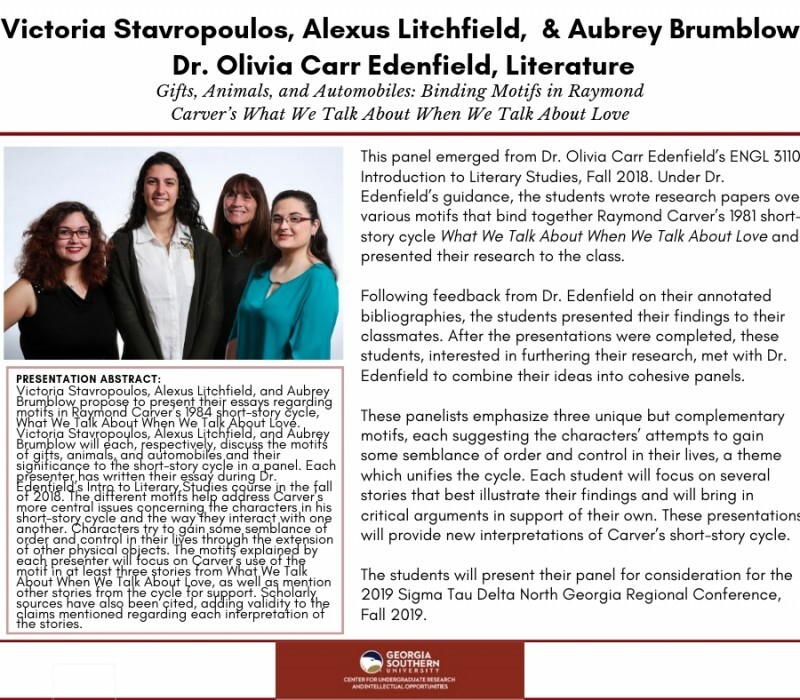 Through undergraduate research symposia and academic conferences, students will have the opportunity to share their work as they experience the fulfillment of scholarship and creative activity. Students who have experienced scholarship in meaningful ways offered through undergraduate research experiences are better prepared to address future problems and to assume important rules as enlightened citizens and leaders. 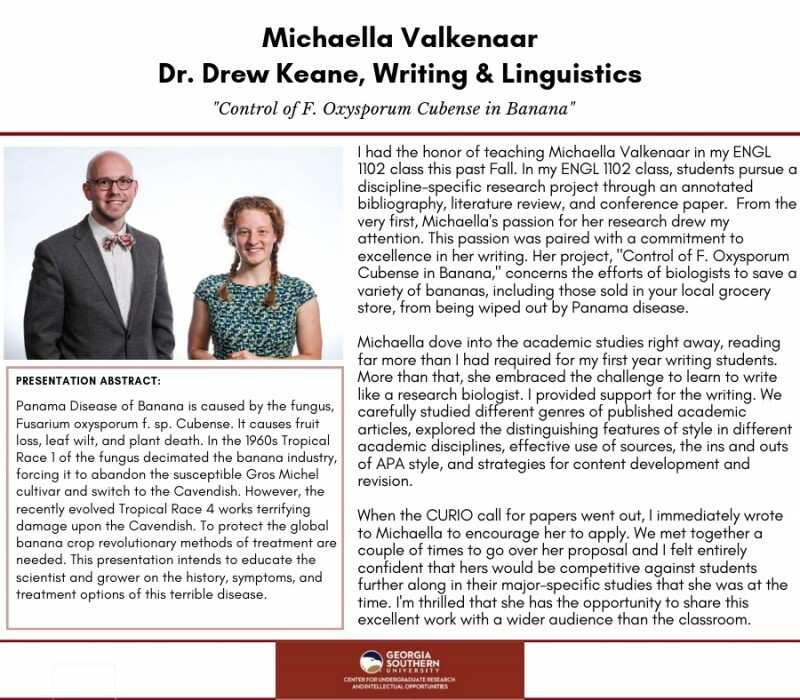 To that end, students’ undergraduate research experiences will begin their professional lives. 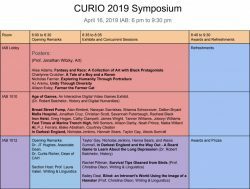 To help them reap the full benefits of participating in undergraduate research, CURIO offers a variety of resources to help undergraduate research become a distinctive feature of students’ undergraduate experiences. 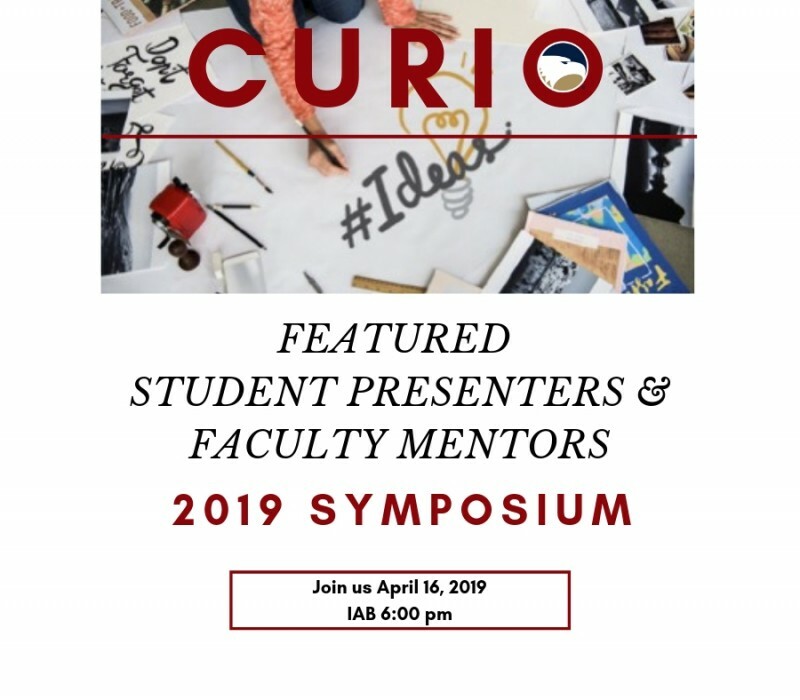 The 2019 CURIO Symposium will take place Tuesday, April 16, 6-9 p.m., in the Interdisciplinary Academic Building (IAB) on the Statesboro campus. 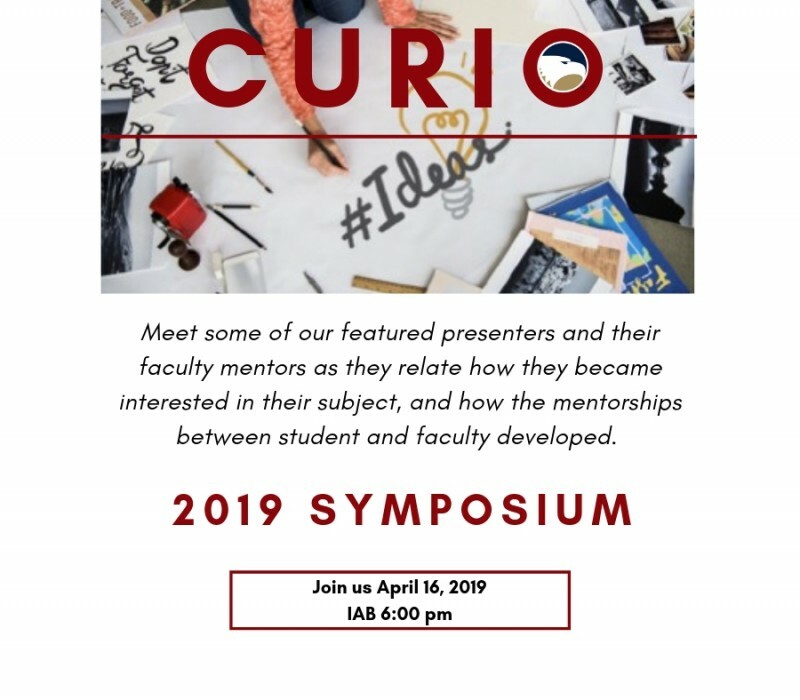 The office for Undergraduate Research & Intellectual Opportunities (or CURIO) is pleased to host an evening highlighting the best research and creative endeavors of the college’s students at the CURIO Symposium to be held in Spring 2019. 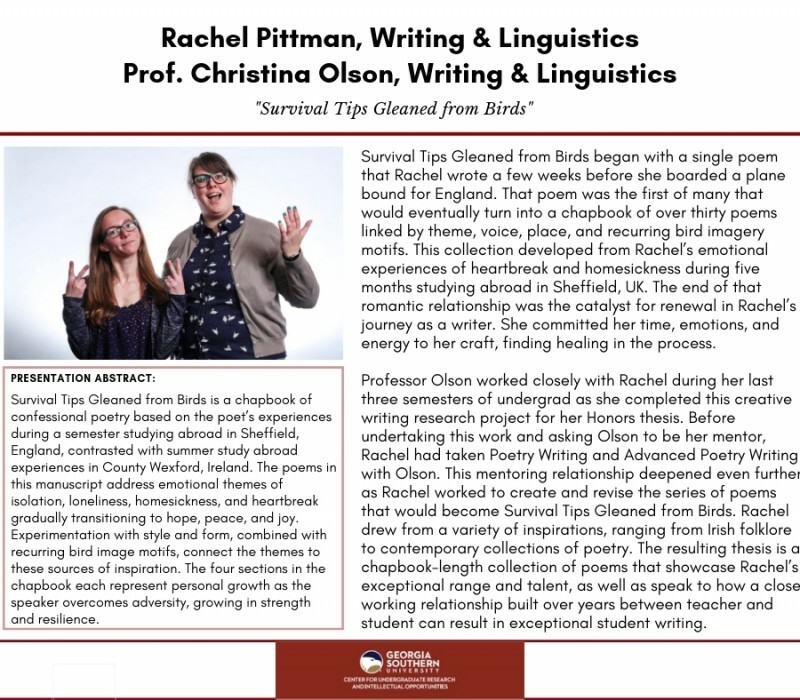 We welcome submissions from currently enrolled undergraduate students from all major and minor areas of study in the College of Arts and Humanities. 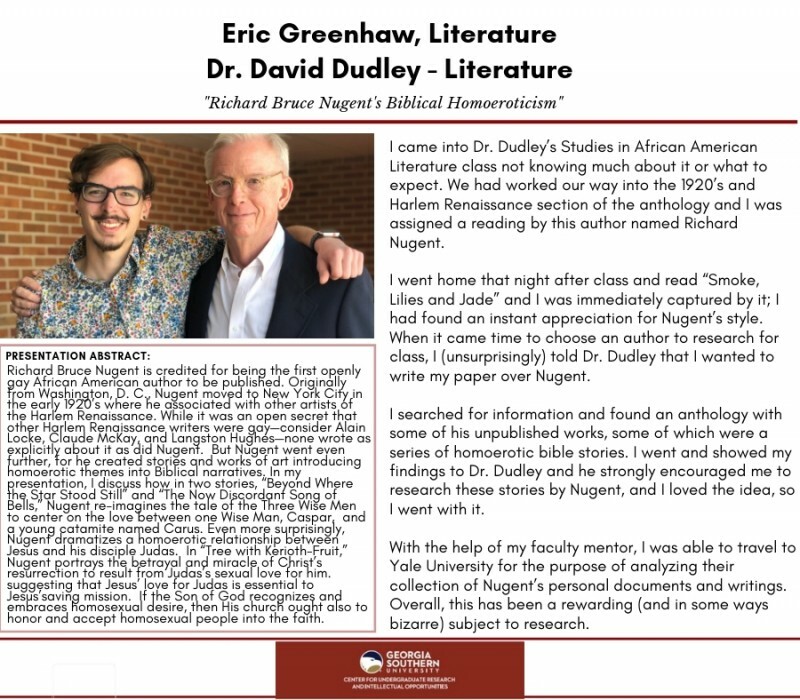 Projects completed during the Spring 2018, Summer 2018, Fall 2018, and Spring 2019 semesters are welcome. Interdisciplinary projects from those semesters may also be submitted. 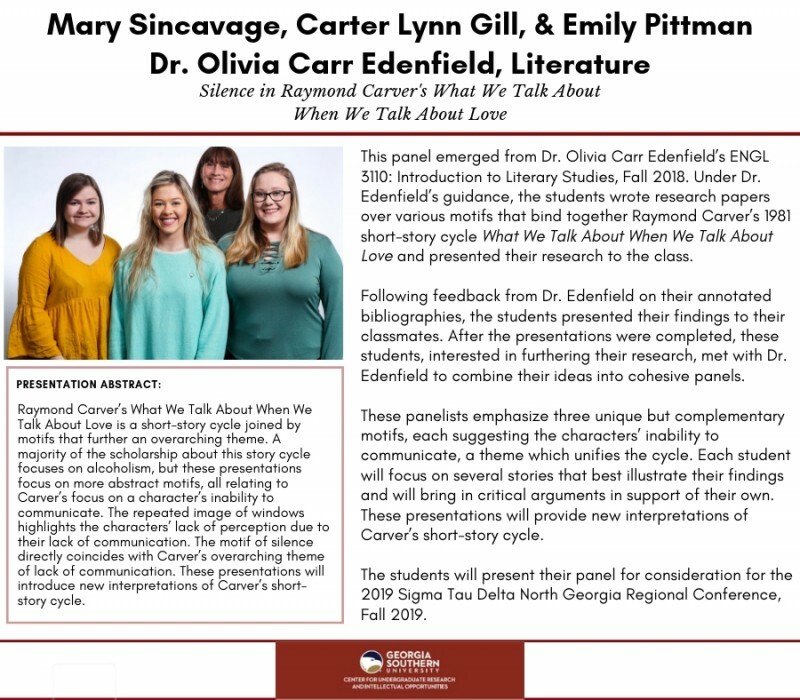 To apply for the Symposium, students should submit a 250-word abstract describing the scholarly or creative activity and the presentation, paper, performance, or poster that will be utilized to showcase their research or creative endeavor. 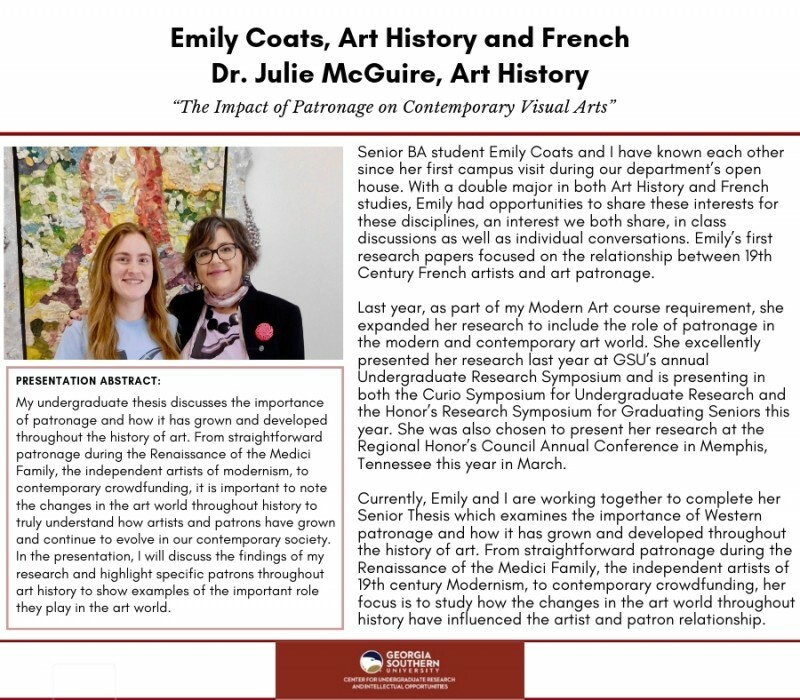 The abstracts should explain how the project represents original student work. The application also requires the listing of a faculty mentor with whom the student worked with on the project. 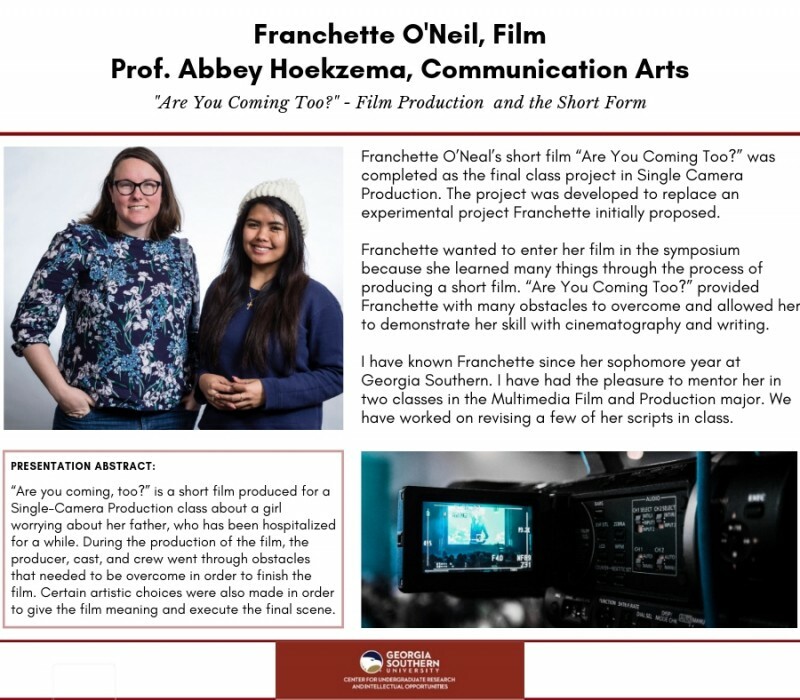 The faculty mentor should help students prepare to deliver their presentation by providing both advice and feedback on their material and physical presentation. Applications will be accepted until Friday, March 1, 2019. Projects selected for the Symposium program will take the form of 10-15 minute presentations, readings, or performances. Students presenting posters will be allotted time to discuss their work. 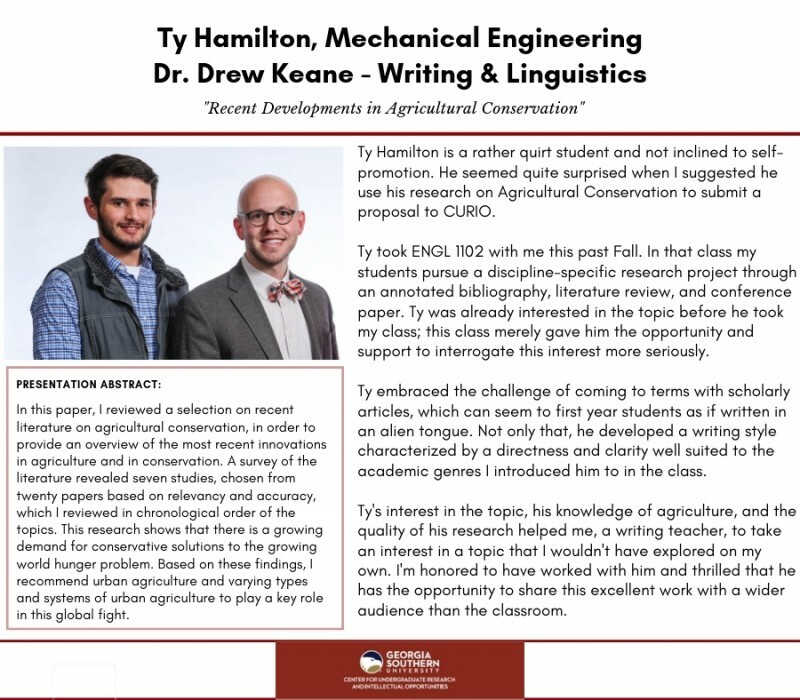 If selected to participate, students must be physically present at the Symposium to comment on their research, presentation, performance, or poster and to respond to questions from the audience. 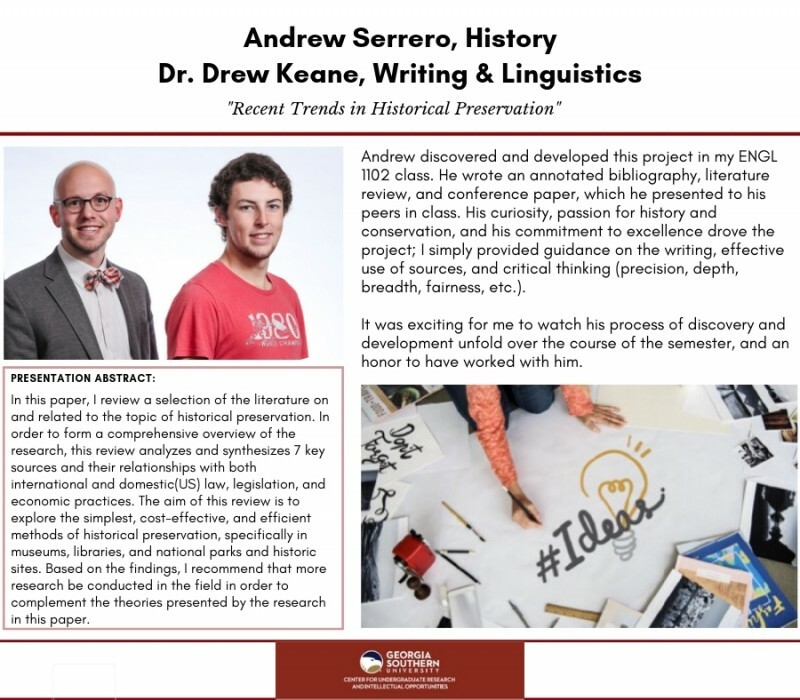 Selected papers, projects, performances, and posters need be in final draft format or ready to be performed by April 1, 2019. 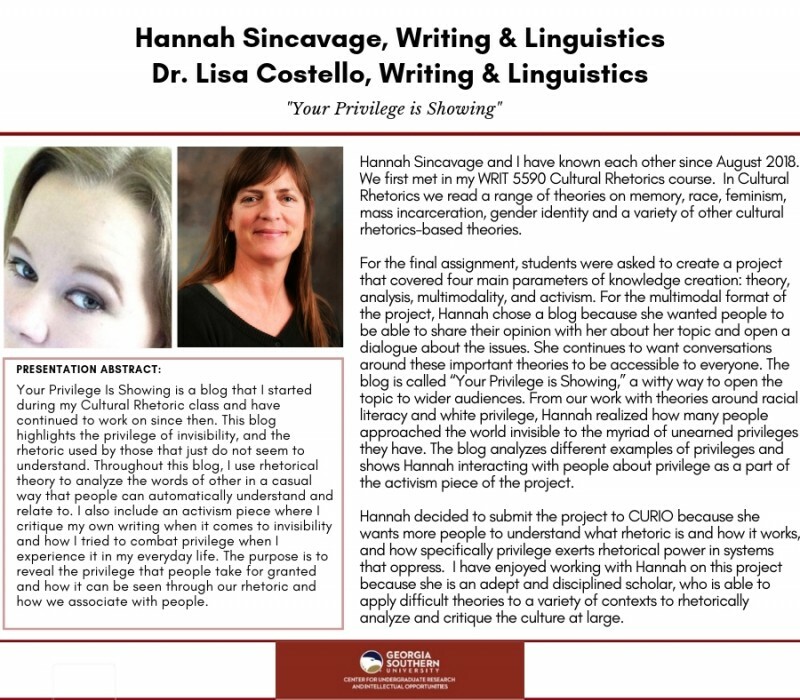 Outstanding presentations, performances, and posters in the humanities, fine arts, and social sciences, as determined by judges, will be recognized at the Symposium with a monetary award and the student’s name on the website.